Jim Stechschulte: Oh, which NC State team will show up on Saturday afternoon? The one that has beaten North Carolina, Duke, and Louisville? Or the one that has lost to Wake Forest, Clemson, and Boston College, the latter two by double figures? In those three victories, the Wolfpack made 45.1 percent of their shots, including 44.2 percent from three, and allowed their nationally-ranked opponents to only 34.8 percent of their field goals. In those three brutal losses, State shot a combined 34.7 percent from the floor and allowed their foes to make 53.4 percent of their shots. Over the course of the season, State is just a little bit better on paper than the Orange across the board and having two strong three-point shooters in Trevor Lacey and Ralston Turner should give them just enough firepower to win. NC State 70, Syracuse 67. Matt Dagostino: The Syracuse swan song for the 2014-15 season. At the beginning of the season, this game Saturday against NC State looked like one that could decide tournament hopes or seeding. Now, it just culminates a forgettable season for the Orange. But, we do know that the winner of the game in Raleigh will be 19-12 overall and 10-8 in the ACC. The loser will be 18-13 overall and an even 9-9 in conference. Of that, I am certain. A lackluster effort against Boston College a week ago notwithstanding, Mark Gottfried’s club has run off a nice little streak. Four wins in their last five games, two of which were against ranked foes. The Wolfpack have knocked off three ranked opponents in total this season. Of the five losses to ranked teams, three of them were by a combined nine points. They play with a grittiness that is tough to match. Meanwhile, the Orange look to shrug off a game against Virginia that got away from them. Rakeem Christmas will look to end his college career in style and Trevor Cooney will look to build on Monday’s game that saw him make more than one 3-pointer for the first time since Valentine’s Day. I’ve gone back-and-forth on this game all season. But, I prefer to end the campaign with my rose-colored glasses firmly entrenched on my face. 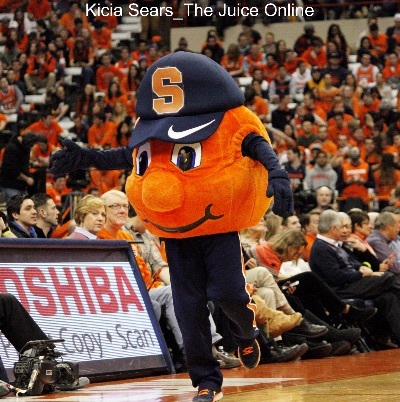 Syracuse 68, NC State 63. 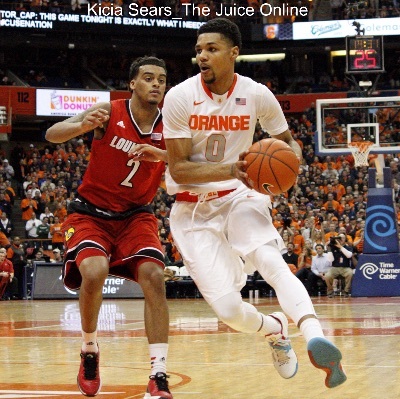 Saugat Sen: NC State and Syracuse have the same exact season and conference record. So this game will decide who will get to double digit conference wins. NC State has now won 4 out of their last 5, including wins against Louisville and UNC. Syracuse, on the other hand, has lost 3 of their last 4. NC State coach Mark Gottfried has taken pride in his team’s half court defense, something that the Syracuse offense has struggled mightily against. On top of that, the Wolfpack have had no problem containing teams with a star big man, so expect that trend to continue. NC State 68, Syracuse 59. 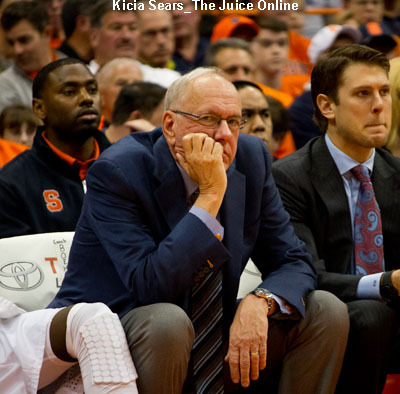 Brad Bierman: The self-imposed, 2014-15 finale against the Wolfpack marks the earliest a Syracuse basketball season has ended (March 7) since the 1969-70 team went 12-12 and finished on March 2 of that year. The 1973-74 team lost its first round NCAA game that season on March 9, exemplifying how big the tournament has gotten in 40 years. As for this matchup, both teams have identical overall and conference records, but for SU there’s no holding back, they can play loose offensively and turn up the zone, so subsequently will we see the team that beat Louisville and Notre Dame, or the version that lost at home to Miami, the season series to Pitt, and struggled at times twice against gritty Virginia Tech? The Pack won at Clemson Tuesday night in a gritty physical game, a place the Orange lost this season, and they’re playing for a shot at the NCAA Tournament on Senior Day in front of the usual loud crowd at PNC Arena – a little bit of an edge. NC State 71, Syracuse 67.